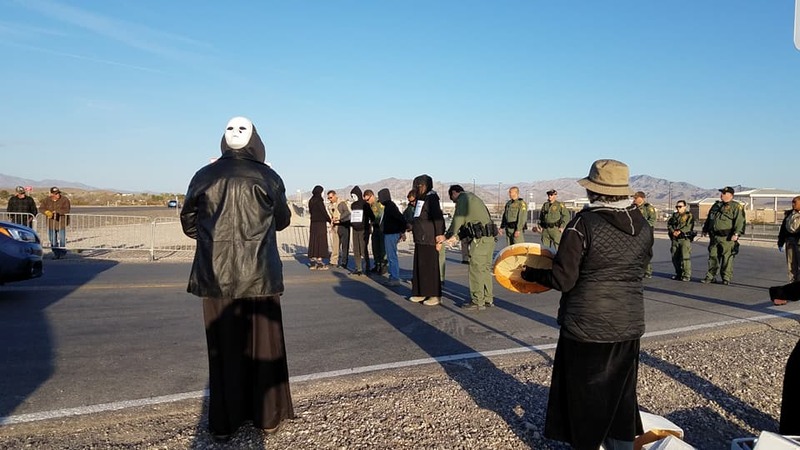 Four women – Toby Blome, Eleanor Levine, Susan Witka and Maggie Huntingon – were arrested on April 3 while blocking the entrance to Creech drone base in Nevada. The funeral procession and action, protesting drone warfare, was part of the Codepink Drone Resistance Week at Creech. Those arrested – they are still in custody at a local jail – for their peaceful opposition to terrorist drone warfare, which makes more terrorists and enemies with its indiscriminate killing, are: Toby Blome of El Cerrito, CA, Eleanor Levine of Oakland, CA. , Susan Witka of San Francisco, CA and Maggie Huntington of Flagstaff, AZ. CODEPINK, Veterans for Peace, and others said they are protesting increasing U.S. drone killings of civilians, including women and children, in Niger, and Mali, along with continued drone attacks in Afghanistan (“the most droned place in the world”), Yemen, Syria, Iraq, Somalia, Libya and Pakistan. According to organizers: “With this week’s 50th anniversary of the My Lai Massacre, where the U.S. military slaughtered over 500 villagers in Vietnam, it is a time to reflect. The ongoing U.S. drone attacks represent modern day mini-My Lai massacres…relentless and barbaric, “hunting” people who have no ability to defend themselves. CODEPINK had a small crew last week, but we accomplished a lot. Huge banners and signs opposing the barbarism of drone assassination colored the highway all week during am and pm commute traffic into and out of the base. Themes included: “Ending Militarism at Home & ABROAD,” “RESIST, DISARM, REFUSE,” “ WAR IS NOT GREEN,” and many others. On Tuesday morning, activists created a very mournful funeral procession along the highway in black dress and white masks, while carrying coffins labeled with the 9 countries the U.S. is currently “droning.” Each person also wore a sign listing the name and age of a young child that had been killed by U.S. drone missiles in YEMEN. The procession eventually continued onto the roadway “to stop business as usual” at Drone Creech Killer Drone Base. Cars backed up for a long distance down the highway, and, curiously, were NOT diverted to another gate. Most of the marchers were willing to stand in the roadway until their 2 minute warning ended, and 1/3 of our crew stepped forward to risk arrest. Maggie Huntington, Eleanor Levine, Susan Witka, and Toby Blome were take promptly to Las Vegas Jail for blocking the entrance to the base and refusing to disperse. All were later cited and released in the late afternoon. Many of us noticed much fewer supportive waves and peace signs exhibited by military personnel compared to past vigils. Later in the week it was revealed to us by a confidential source that the commander of the base has given very strict orders to not look at, wave, give peace signs or interact in any way to protesters. In spite of that, there were a handful each vigil that were willing to question authority and express their free will. At the end of the week, a large banner was displayed to spread the great news that over 3,000 Google employees “said” NO TO DRONES, by signing a joint letter to their CEO to end the contract Google has with the U.S. Military to design technology that will be used in the drone program. MEDIA ALERT & MEDIA COVERAGE below. Of the 61,723 US Air Strikes in the Middle East in 2016, 81% of the time the targets “had been under a Reaper’s crosshairs” at some point during the “discovery to destruction” cycle. (Details in Ann Wright’s post below). WE NEED HUNDREDS PROTESTING WITH US AT CREECH THIS FALL!!! Of note: While we were protesting at Creech this week we witnessed a drastic increase in Reapers taking off and landing, practically every 5 minutes. This is a dramatic change. These are new pilots in training. This is a very worrisome sign. Please won’t you join us whenever you can to stop this barbaric madness? INDIAN SPRINGS — Officials say four protesters were arrested outside a U.S. Air Force base near Las Vegas during an annual demonstration against military use of drones in attacks overseas. 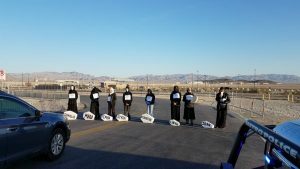 Renay Davis, a San Francisco resident and protest organizer, said four of the 12 people who turned out for the demonstration were arrested early Tuesday at Creech Air Force Base, about 45 miles northwest of Las Vegas. Clark County jail records show four women ranging in age from 62 to 75 were held on misdemeanor jaywalking and failure to disperse charges. Davis says protesters plan to return to the base in Indian Springs twice a day this week. A base spokeswoman didn’t immediately comment. The Air Force has said following previous protests that it respects assembly and free speech rights, but is committed to critical national security missions.